A small laceleaf tree with beautiful cascading branches. 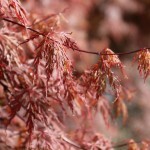 In the spring, the leaves emerge orange, changing in summer to a rich red-green with a golden orange overlay. The fall color is orange-red. It performs well in the heat and prefers a well-drained site. It tends to not grow as wide as other lace-leaf types, making it a good choice for containers.